Wit's End: What do all these birds species share in common? The abnormality sometimes is accompanied by elongated claws, abnormal skin or variations in feather color. Van Hemert said the disorder first was noticed in significant numbers around 1999. It has increased dramatically over the past decade, affecting 6.5 percent of adult black-capped chickadees in Alaska annually. Biologists have documented more than 2,100 affected individuals and increasing numbers of other species, such as nuthatches and woodpeckers, have been spotted with beak deformities. "They're eating different things, they live in different habitat – crows are mostly intertidal, chickadees tend to be in birch forests – they're kind of occurring in different parts of their habitats and ecosystems and they're still affected by what seems to be the same problem," Van Hemert said. 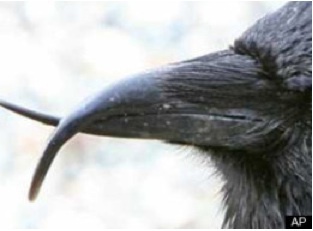 The scientists said beak deformities can be caused by environmental contaminants, nutritional deficiencies, and bacterial, viral, fungal or parasitic infections. In the past, large clusters of beak deformities have been associated with environmental pollutants such as organochlorines in the Great Lakes region and selenium from agricultural runoff in California. The deformities affect birds' ability to feed, Van Hemert said, though many birds appear to cope by relying on food provided by humans at feeders rather than foraging. Deformed beaks also can prevent adequate preening, she said, leaving feathers matted, dirty and without insulating value needed to survive the cold. The increasing occurrence of deformities in multiple bird species with broad geographic distribution suggests that avian keratin disorder is spreading, they said.